Tilicum Mall is having a 30 year celebration! I’ll be signing copies of my new book at Coles Books from 1-3 on Saturday November 24. If you’re in Victoria, don’t miss this chance to get an autographed copy. It makes a perfect children’s Christmas gift and proceeds go to support Jeneece Place, a home away from home for island families with children in need hospital care. Coles will have some of my other books too so drop by. It’s in the lower level of the mall. Hope to see you there. Thanks. 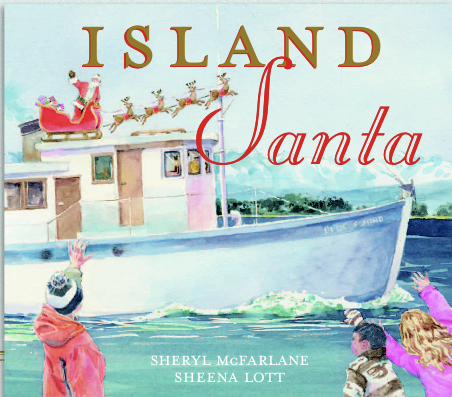 It’s a fictional story but based on the Santa Boat which has been delivering Xmas presents to Gulf Islands and San Juan Islands kids for more than 60 years. Hope you don’t mind if I ask this here, but is this a nonfiction picture book? Either way it looks fab!